Although the U-FGM has been part of our model line ip since the late seventies, the current version only shares the basic, external shape with that original version. The material, port, closing rail, glove and basically every other detail was subject to the continual improvement process that is part of our manufacturing philosophy and has evolved and changed in numerous iterations over the years. If you want to use a analog, manual SLR with a side mouted flash, like a Metz Mecablitz 45 CL-4 Digital hammerhead flash, on small boats, in the surf, for underwater portraits, swimming, snorkeling or diving, then this is the product for you. It is easy to operate the camera as its various components and buttons can be operated through the PVC. The original U-FGM SLR underwater housing was desigend at a time when analog film still had to be transported by hand between each shot and autofocus was a concept that was in the realm of science fiction. As a result it has a "glove" to allow access to the film transpot (normally done with the right hand thnumb), shutter release and lens control. 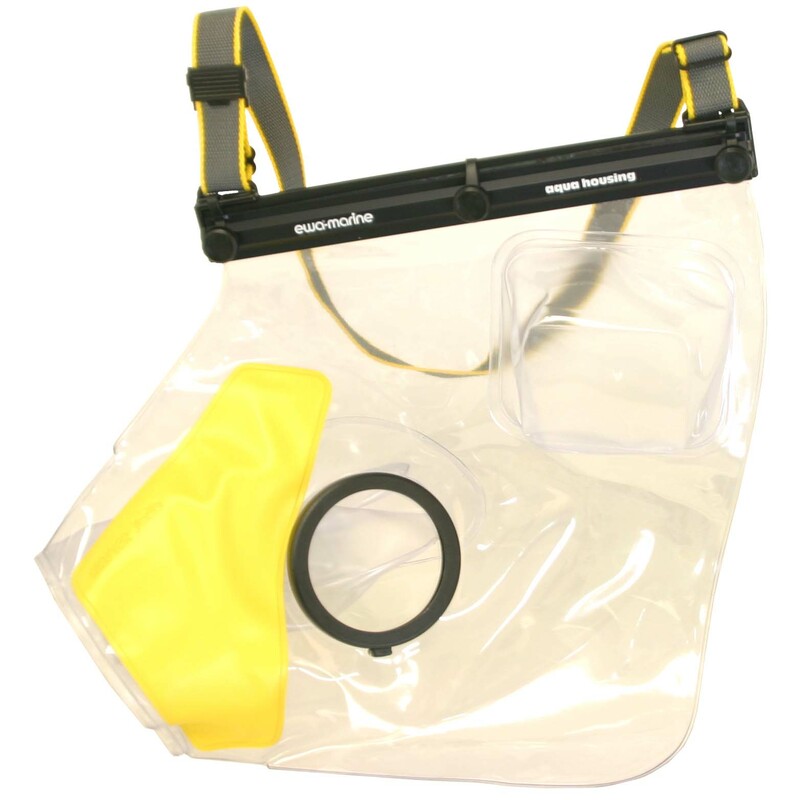 The U-FGM is designed for underwater use up to a depth of 10 m / 30 ft. The limiting factor is caused solely due to operating difficulties of the hand in the glove below this depth. Please note: modern digital SLR cameras will not fit into this housing. They are too big. The U-FGM is a practical, "all-round" housing that is primarily intended the be used while swimming, snorkeling and other, general water sports. It is is limited to 10m / 30ft. A depth where you also can still take pictures with ambient, natural light. Since underwater photography generally requires the use of wide angle or macro lenses and thus shorter lenses, the lens tubes on the housing is kept rather short. Please note: modern digital SLR cameras will not fit into this housing! Designed specifically for dSLR cameras without autofocus or automatic film transport, the ewa-marine U-FGM underwater housing is manufactured from our special, double laminated PVC and has an integrated, optically neutral flat glass as a front port. With this housing you will receive a set of adapters that fit the filter threads of the most popular lenses on the market today. By means of this adapter the camera is then docked into the housings front port, ensuring that the lens remains parallel and centered behind the front of the lens. Just as if it were a clear, neutral optical filter. Some of the older versions of this housings use a velcro system to fixate the camera between the view-finder and front ports. This systen can not be repaired, but we can update the housing to our SF90 and CA adapter version. Similarly housings with the older SF80 front port can only be updated to the SF90 system. The following list represents some of the cameras that will fit into this housing. But du to the production life of the housing it is not fully comprehensive and will also cover a range of other cameras.